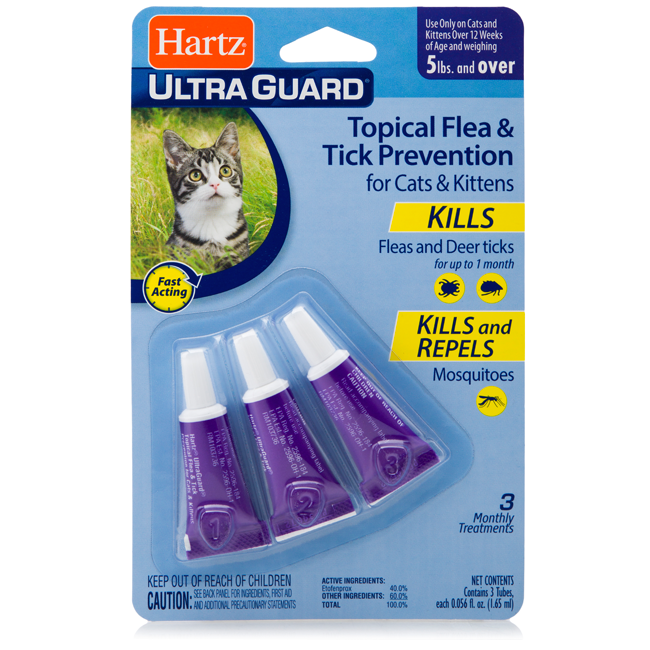 Tell pesky parasites to ‘bug off’ with the Hartz UltraGuard Flea & Tick Treatment for Cats and Kittens. Each convenient and easy to apply, single dose tube kills fleas and deer ticks. Also repels mosquitos. Use only on cats and kittens 12 weeks and older weighing 5 pounds and over. Package contains three treatments —a three-month supply. Remove one applicator tube from package and hold in an upright position away from your face. Pull off cap. Turn the cap around and place on top of tube. Simply press cap down to break the seal of the tube and remove cap carefully. Position the tip of the tube at the base of the pet’s back between the shoulder blades and squeeze out the entire contents of the tube to form a stripe as you move from the shoulder blades along the back to the base of the tail. The treated area may appear oily after application. Repeat every month. Consult a veterinarian before using this product on debilitated, aged or medicated pets. If signs of sensitivity occur, bathe your pet with mild soap and rinse with large amount of water. If signs continue, consult a veterinarian immediately. Remove one applicator tube from the package and hold in an upright position pointed away from your face. Simply press cap down to break the seal of tube. Remove cap carefully. Prior to application of the product, gently lift the cat’s or kitten’s hair coat on the back of the neck at the base of the skull, position the tip of the tube on the cat’s exposed skin and squeeze out the entire contents of the tube onto the cat’s skin. Do not bathe cat within the ﬁrst 24 hours after Spot On product has been applied. Households with more than one cat should prevent cats from grooming each other until solution has dried. Repeat application once every month. HAZARDS TO HUMANS: CAUTION: Causes moderate eye irritation. Avoid contact with eyes or clothing. Wash thoroughly with soap and water after handling and before eating, drinking, chewing gum, using tobacco or using the toilet. HAZARDS TO DOMESTIC ANIMALS: For External Use on Cats Only. Do not use on kittens less than 12 weeks old and less than 5 lbs. Consult a veterinarian before using this product on debilitated, aged, pregnant or nursing animals. Certain medications can interact with pesticides. Consult a veterinarian before using on medicated cats. Sensitivities may occur after using ANY pesticide product for pets. If signs of sensitivity occur, bathe your pet with mild soap and rinse with large amounts of water. If signs continue, consult a veterinarian immediately. Due to the bitter taste of the product, oral exposure could result in salivation. Be careful not to get any product in the cat’s mouth during application. For multiple cat households, prevent the cats from grooming each other until the product has dried. If the salivation continues or other clinical signs are noted, please call 1-800-275-1414. PHYSICAL OR CHEMICAL HAZARDS: Combustible. Do not use or store near heat or open ﬂame. FIRST AID IF IN EYES: Hold eye open and rinse slowly and gently with water for 15-20 minutes. Remove contact lenses, if present, after the ﬁrst 5 minutes, then continue rinsing. Call a poison control center or doctor for treatment advice. 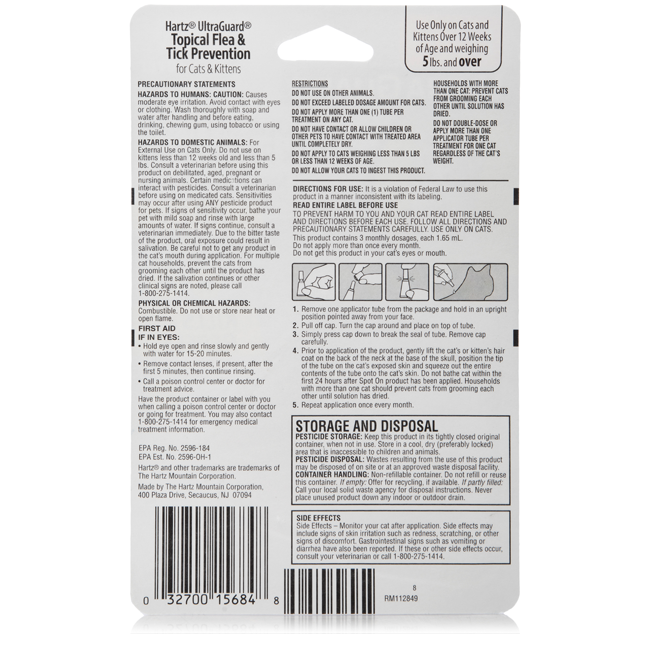 Have the product container or label with you when calling a poison control center or doctor or going for treatment. You may also contact 1-800-275-1414 for emergency medical treatment information. CONTAINER HANDLING: Non-reﬁllable container. Do not reﬁll or reuse this container. If empty: Offer for recycling, if available. If partly ﬁlled: Call your local solid waste agency for disposal instructions. Never place unused product down any indoor or outdoor drain.